Kill 99.9% of Germs the Natural Way. Plant Based & Alcohol Free. We would like to introduce you to the Germinator. This all natural, germ terminating solution is a super tough sanitizer that doesn't contain a single drop of alcohol. It works just as good as the traditional stuff, but it is way safer and much easier on your skin. It won't dry out your hands like the regular stuff does, and it is totally safe to leave around kids and let them use. Kill 99% percent of the germs on your hands using this safe and natural solution to help prevent the spread of germs and diseases. It is a foaming solution so it dispenses a nice fluffy foam of germ killing goodness. THis foam is easy to apply, but it also has the benefit of delivering twice as many uses when compared to the same amount of a gel. The Germinator is completely plant based so it remains incredibly safe as it neutralizes germs in just 15 seconds. This large, 250 ml, size is perfect for the bathroom or kitchen. If you would prefer a size that is a bit more portable, then check out the travel size Germinator. Soften and condition your skin as you clean it. This alcohol free hand sanitizer also contains a moisturizing agent to help nourish your skin as you sanitize your hands. In just 15 seconds you will be able to kill virtually every disease causing germ on your hands and add moisture all at the same time. Germinator contains no fragrance or harsh ingredients either, so it is safe to use on even the most sensitive skin. Because it works by utilizing natural, plant based ingredients instead of alcohol and other harsh chemicals, it is far more gentle without being any less effective. Stop wasting money on traditional hand cleansers that destroy your skin or smell awful. Start using this natural alternative and your skin will feel great as you ward off any germ that tries to make you sick. Simply pump a small amount of foam into your palm, then rub thoroughly over all surfaces of your hands. A little bit goes a long way because instead of a traditional gel or liquid consistency, this ccontainer pumps out a light and frothy foam. This helps to cover surface area while using less solution, and will actually give you almost twice the uses when compared to your normal sanitizer. Keep rubbing until your skin is completely dry. There is no rinsing or towel drying necessary. This gentle, yet powerful solution quickly neutralizes germs and leaves your hands feeling great. It contains no fragrance, harsh chemicals, or toxic ingredients. This makes it great for virtually anyone and perfect for those with sensitive skin. Unscented. 250ml. Traditional hand sanitizers are heavily reliant on alcohol or other similar compounds to kill germs. These can be bad for your skin, but more importantly incredibly dangerous if accidentally ingested by young ones. Just a small amount either licked off a hand, or ingested directly from the bottle can cause serious problems. This natural alternative works just as good, but you don't have to worry about any of the side effects. It is an easy-to-use product that is incredibly safe and effective. Thanks to the foaming solution it will also last much longer that traditional gels too. Our alcohol free hand sanitizer kills 99.9% of germs that may cause illness, including E-Coli and MRSA in just 15 seconds. It is a gentle yet effective formula that contains added moisturizing agents to enhance your skin as you eliminate germs. This large size, table topper is a must have for any room throughout your home. It is also perfect for offices and classrooms. Germs are everywhere and so should the Germinator. It is a quick and safe way to never have to worry about spreading germs again. Place one next to the changing table, use it in the kitchen or bath, or virtually anywhere else in your home or office or school. This hand sanitizer is great because it won't harm the environment and it is totally safe for use around children, food and sensitive skin. Stop using harmful alcohol based sanitizers. Choose a safe and natural alternative. Order Yours Today! 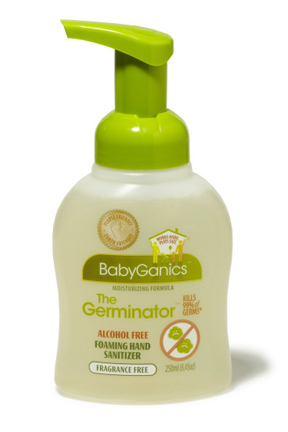 The Germinator - Household size Alcohol Free Foaming Hand Sanitizer - Sanitize your hands the safe way! This alcohol free hand sanitizer works great and is safer than traditional products. Get the same results without any of the drawbacks. Order Yours Today!